The Sesquicentennial Bandshell is located in the 39 acre Pennoyer Park, along the shores of Lake Michigan. The Bandshell was dedicated on July 4, 1988. 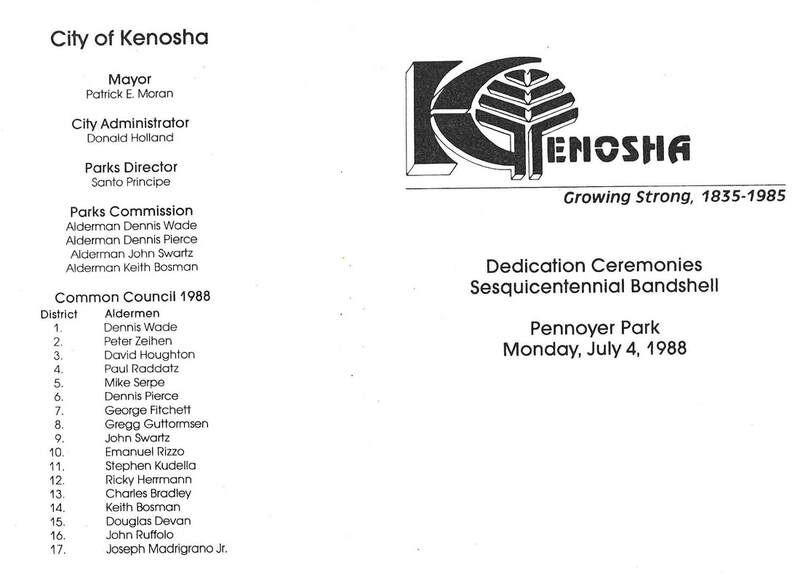 It was a gift by the Sesquicentennial Committee formed, in early 1985, to commemorate the City's 150th birthday. Committee members numbered 33 and chairs were Leon Pascucci and Lois Stein. From January through November of that year, the Committee worked with the City departments to identify the requirements for location, size, climate, acoustics, security, neighborhood impact and utilities for a bandstand or shell. By early October, the Committee had raised $82,000 through contributions and corporate gifts. Robert M. Kueny of Kenosha was the architect. ​The Kenosha Pops Concert Band regularly plays at the bandshell. Tuesdays at the Shell offer a variety of music to the public. The Bandshell has its own Facebook page which describes all events going on there. Other special events occur at the bandshell, including church services and concerts. Kenosha native Laura Kaeppeler, 2012 Miss America, performed at the bandshell during her reign in the summer of 2012. These two mosaic murals were placed on each side of the bandshell sometime between 2004 and 2008. They were created by Kenosha youth students under the direction of art teachers, as part of City of Kenosha's Youth Employment in the Arts Program.